It seemed that the Rand was in a post-Moodys hangover mode last week, where everything happened a little slower than normal. The Rand traded within in tight ranges on a very sparse data and event week. However, the Moody’s decision brought about positive sentiment in the market and we a believe the bias for a stronger Rand that we saw last week will still be in the offing this week, as the gloomy picture of the global economy has lightened a little. One of the main data events last week was the re-start of the US-China negotiations, and the news filtering through from the talks is that a deal could be struck soon. 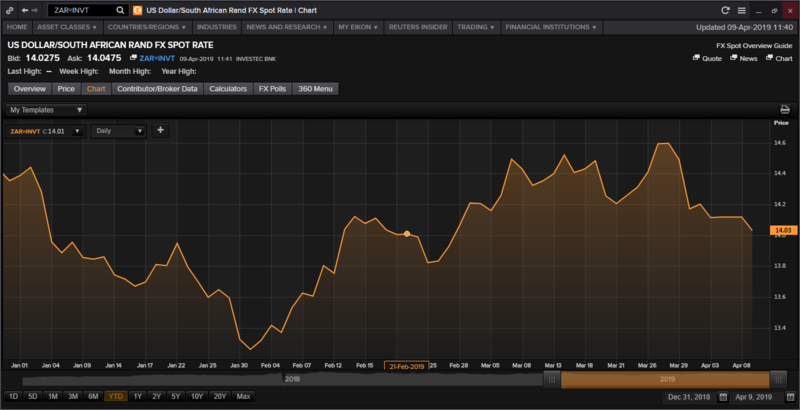 The positive sentiment has flowed into the market and has undoubtedly helped the Rand pushing slightly lower. The worry, however, is that when the deal is reached that one party could be worse off and the possibility that the terms of the agreement could be breached, but that is for the medium term, and as things currently stand the news is positive. The big data event from last week was the release of the US nonfarm payroll, that came out better than expected and normally would have been Rand negative, but the average hourly earnings fell a little suggesting a slowdown in inflation, which will negate any notion that Fed might have to turn hawkish on a positive headline number. This saw the Rand appreciating as the expectation is that the Fed will stay dovish and this will play into the hands of EM’s. The Rand has started this week much in the same vein as what it did last week with range-bound trading, but there are a few events in the week that could affect the Rand. As we head into the final stretch before the elections, headlines will gain in significance and add to volatility in the next couple of weeks. Apart from the expected patchy and erratic headlines from the elections both the ECB and Fed will have events tomorrow which should they be dovish enough could see the Rand on the front foot. We have the ECB meeting tomorrow regarding their interest rate and we expect no action. The key would be whether the ECB has become more dovish after last months meeting in the wake of disappointing economic data. The release of the FOMC will also be a study of dovishness and should the market detect that the Fed has become more dovish; it will benefit the Rand. TreasuryONE offers a daily market view and daily market rates in the morning and afternoon via WhatsApp. If you want to receive up to date market information, please add the following number to your contact list – TreasuryONE market rates no 061 109 3649 and complete the following form for us to add you to the service. TreasuryONE is an authorised financial services provider. FSP no 22433. The world economy in focus!